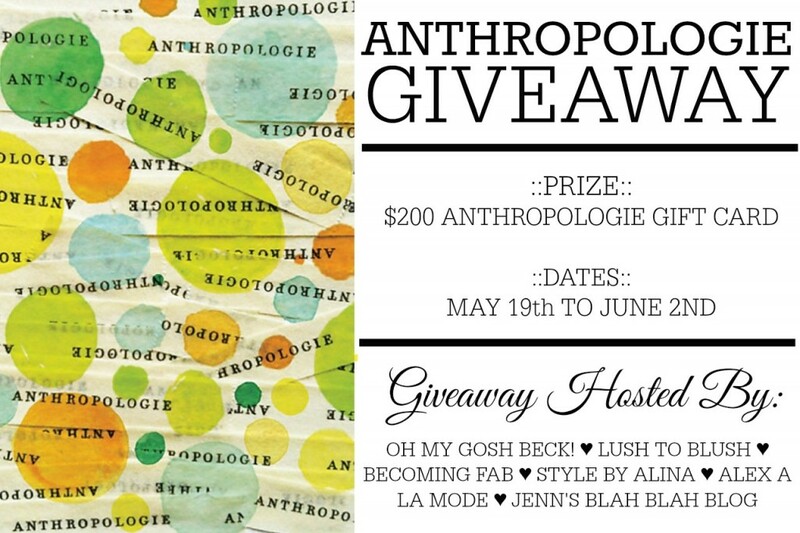 $200 Anthropologie Gift Card Giveaway! Got positive news from the Doctor today. My child got an honor roll award. My cat Fed caught a mouse in our storage room. I was able to eat breakfast this morning. Sounds funny, but as a busy mom, its a big deal. My husband and I both have good jobs! My stepson’s mom lives outside of the country. She wasn’t coming to see his high school graduation, but today she got tickets and she is coming! I got to have a lovely breakfast on the deck this morning and I have a long weekend to look forward to. I won a Sephora makeup set. My friend offered to help me paint today. It was hard work but it was done in half the time. I got to sleep in late today because I had the day off. I get another three day weekend. I found your blog! 🙂 And I’m ready to make a Mango smoothie for breakfast (it’s early-ish!). I get to watch my stepson play ball today.